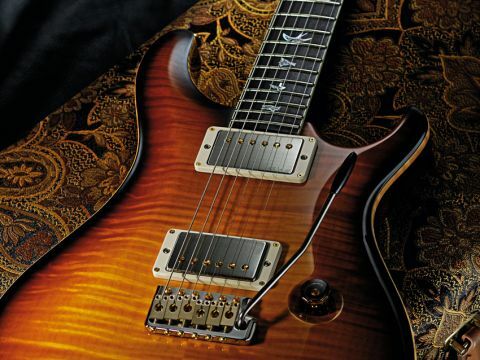 This is one of the finest and most classic-sounding PRS guitars we've played yet. No choice of new-generation pickups. The body boasts a gorgeous flamed maple top. The fretwork on the Quatro is very impressive indeed. The 53/10 humbuckers are full of rock heritage. The Quatro's neck is shaped from unusual dalbergia wood, sourced in India. The new neck profile is slightly slimmer than a wide-fat. As the premier guitar in PRS's USA line, the ME Quatro isn't aimed at novices, or those who are unfamiliar with the brand. It's designed for experienced players with plenty of cash to spare, and occupies a high position in the aspirational pantheon for PRS devotees. Why? Well, it could easily be described as the culmination of a lifetime's guitar making by PRS founder Paul Reed Smith, who's still driven to improve the electric instrument nearly four decades on from building his first one. "Smith's reference point is not his contemporary competition; it's the classic guitars of yesteryear." The fourth version of the Modern Eagle, originally introduced in 2004, offers further justification of this, not least that it's the first PRS to feature the 53/10 humbuckers, the latest in the line of new- generation pickups (which also includes the 57/08 and 59/09), inspired by the classic Gibson PAF. They use coil wire created on the machine that supplied Fender and Gibson back in the '50s. Smith's reference point is not his contemporary competition; it's the classic guitars of yesteryear and many believe that, more than any other production maker, he's close to nailing the sound of those 'golden era' guitars. But it's not about replication - a PRS guitar is different from a vintage Fender or a Gibson, and for some it's more desirable. Yet Paul Reed Smith remains very guarded about these new pickups and the most we could ascertain is that the 53/10 uses "exactly the same wire from the same machine that Fender put on 1953 Tele pickups. The 53/10 and 57/08 have the same output; the 53/10 has a slightly sweeter high end". Another difference present on the Quatro is the dalbergia neck and fingerboard (the dalbergia genus includes numerous rosewood species). "We started to play around with a whole bunch of dalbergias - rosewoods," says Smith. "It turns out that God grows trees in India, and we were able to get a supply of extraordinary wood, which we ended up using on the Quatro. Technically, it's an Indian rosewood, but not all Indian rosewood is created equal." Shape-wise, the new 'pattern' neck profile - "very close to a wide-fat but it's a little slimmer [in depth]," says Smith - feels slightly less 'V'-shaped than a couple of the older wide-fats we compared it to, but the shoulders are still slender. It's still got a relatively thick neck from back to front (approximately 21.5mm at the first and 23.6mm at the 12th), but it certainly doesn't feel overly big or clubby. We have grained ivoriod binding around the fingerboard edges, shaped beautifully with a comfortable inward curve, and the top edge is typically rounded. The fretwork is superb - a larger-than-standard ME/513 gauge (2.7mm wide x 1.37mm high, according to PRS specs) - and the fret ends sit over the binding. In fact, the binding is so well done that you don't notice it, aside from the colour contrast with the chocolate brown neck and fingerboard. The feel of the neck is different to a gloss-finished standard one too - it's slightly open-grained, but feels like it's been burnished. "It's got finish in the grain," confirms Smith. "It's like a marine jelly that we rub in. It fills in the grain, then we sand it down and buff it up." Aside from the new pickups, we have another new-to-PRS feature. That coil-split switch on the tone control has two additional resistors. Previously, in coil-split mode, the slug coil was shorted to ground, leaving just the screw coil in circuit. This new circuit "doesn't completely cancel the slug coil," explains Smith. "It sort of three-quarter coil cancels. It allows some of the other [slug] coil through. It's also slightly hum-cancelling. All the guitars have this now, even if they're using the old pickups," he adds. There's also a treble bleed capacitor on the volume control, retaining highs as the volume is reduced. With a lively, ringing sustain, the Quatro's pickups are in the classic PAF vein for output. Don't expect a big push to drive your amp's preamp stage - that, from where these pickups are coming from, hasn't been invented yet. Imagine putting a good '50s Strat, Tele and Les Paul, plus a later SG, into a sonic blender and you're close to the sounds here - full-bodied and sweet. The bridge 'bucker can certainly rock, but it's in the classic rather than heavy style. The single-coil splits sound surprisingly full-bodied and, bringing the in-tune vibrato into play, you can nail some rich Fender-esque tones. Even at moderate volumes, a beautiful musical feedback emerges after the note or chord. "That's quite possibly because the guitar isn't damping anything," muses Smith. "If you've got 'rubber' [anything that damps string vibration], it's not going to do that, but if it's really alive it's gonna do that." There's a very quick attack to the note too; an immediacy that is something we've noted and discussed with PRSusers when it comes to 'heavier' timbered necks such as this, certainly when compared with the more usual mahogany necks. "At last year's Experience [PRS's annual open-house event] it was interesting," states Smith. "A guitar the artists gravitated too was the Quatro; it was the sleeper of all the guitars we introduced. It's a 'quiet' guitar." It's also one that's hard to fault. The rub is that to experience it you have to dig deep, even though it will street closer to £4,000. Ask yourself this question: what classic guitar from the '50s could you buy for that money? In that company, the ME Quatro is easier to understand. If only we could just buy those pickups… "This whole building [the PRS factory staff] wants to sell these pickups - the 57/08, 59/09 and 53/10s - separately," concludes Smith. "But the day we do that is the day we sell less guitars, because someone will buy the pickups and won't buy a guitar. That ain't gonna happen… and you can quote me on that!" If retro-rock is your thing - not to mention blues, jazz and soul - then this guitar might well change your perception of the PRS sound.